I don’t typically watch YouTube videos worthy of sharing on this site, but with the popularity of VR (Virtual Reality) going on, I might as well share this one. Over the weekend, a tornado touched down in Colorado, and thanks to the support of 360-degree video on YouTube, those who go out and chase storms can now put viewers right in the middle of all of the action. This video does just that. 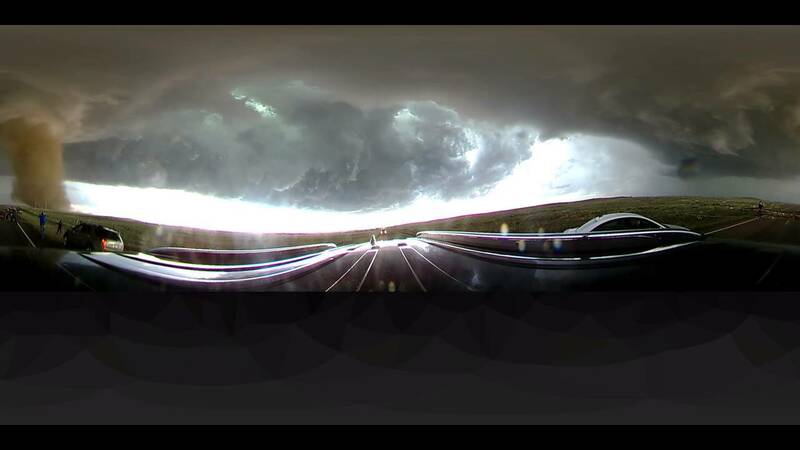 Posted to the AccuWeather channel, a 360-camera (model unknown 360fly camera) is placed on the top of a vehicle which is in pursuit of the tornado. At one point, the tornado is directly in front of the vehicle’s path, and a bit later, the occupants (and other pursuing vehicle passengers), get out and begin to take pictures of the magnificent site. Seriously, the pure destructive power of these occurrences hardly take away from their beauty. If you have a Cardboard viewer, Gear VR, or something along those lines, give this video a watch. Definitely worth the 8 minutes. If you don’t have a headset, don’t worry. Using your mouse, drag the video to an angle you want to watch and get right up in that tornado with the storm chasers. I usually talk plenty of smack on 360-degree cameras and VR in general, but for this purpose alone, the tech is so worth it. Update: According to the Chaser Central account on Twitter, the camera used to capture this video is a 360fly camera.